One of the dirtiest areas in your home is likely your garage – and the dirtiest spot in your garage is the floor. You can have years of dust, bug feces, and dead lizards hiding out in the corners of the garage behind all those boxes. You can have nasty oil and gas spills that stain the floors and penetrate the space with powerful odors. You can have layers of other debris from things like spilled juice boxes, chewing gum, and the ground-up soil and other items you pick up with your shoes. You can makeover your garage with concrete floor coatings, which seal the floors and give them a nice shine. Of course, the floors are thoroughly cleaned before the floor coatings are applied, ensuring that your floors are glossy and clear. No matter how vigilant you are, your garage floor is an easy target for all kinds of damage. It will soak up dirt, oil, gas, and other debris from floor traffic, your vehicle, and fluids and other materials that you store in the garage. Other concrete floors in Carefree, such as your patio, will also soak up dirt from the elements and from foot traffic. Concrete is porous, allowing these things to settle deep in the surface, which will not only make the concrete look bad, but will also damage it over time. Concrete floor sealing in Carefree penetrates deep into the concrete, keeping liquids and debris out of the pores. Floor coatings, therefore, help protect the concrete against damage, including small cracks, pock marks, and more. Concrete floor coatings strengthen the floors. The concrete is strengthened, which means that it will last much longer and will not be as vulnerable to damage. You may take this benefit for granted when you are getting consistent performance from your concrete floor year after year, with no other experience to compare. But if you talk to a neighbor or a friend with concrete floors and start adding up what they are spending on the repairs they mention or the replacement they have to do long before you do, you will realize that the floor coatings are saving you a lot of money. You won’t spend as much on repairs or replacement, and you’ll save yourself a whole lot of hassle in the meantime. You need to sweep your concrete floors regularly to keep them free of dirt and other debris that can stain and damage them. But once oil and other debris has had a chance to get into the pores, it can be very difficult to get the floors clean and keep them that way. You can scrub for hours and use abrasive cleaners and barely seem to make a difference. All the while, you’ll be damaging your floors with all your scrubbing and the chemicals you’re using. When you apply Carefree epoxy floor coatings, you make it a lot easier to clean your concrete floors. The glossy coatings make the floors as smooth as they are shiny. All you’ll have to do is sweep them to keep the dirt and soil off the beautiful surface. If you have a spill, just wipe it up with a towel or a mop. You won’t need harsh cleaners or a lot of elbow grease. Hire the professionals to install your concrete floor coatings and enjoy beautiful and easy-to-maintain concrete floors that will last a lot longer. 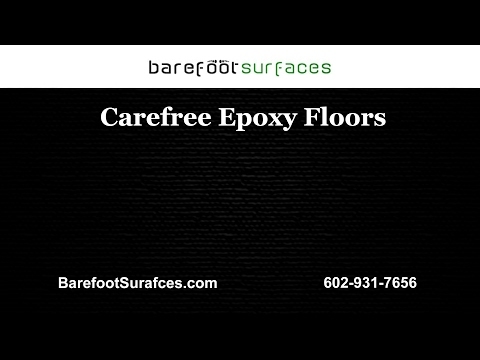 Barefoot Surfaces is epoxy floor coatings expert in Arizona. We offer all types of floor coatings, including a variety of colors, patterns, and textures. You can makeover the look of your floors while also protecting them and saving yourself a lot of money on repairs and replacement over time. You can see a gallery of our epoxy floor coatings on our site, or you can talk to one of our experts about what might look best in your home. We also offer concrete floor sealing for businesses, which will help to create a better first impression for clients. Call us in Arizona today to learn more about concrete floor sealing or to get an estimate for your project.